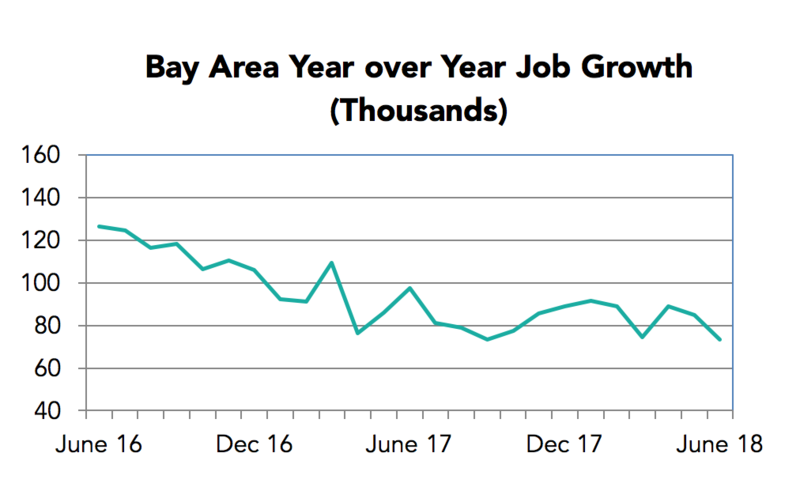 Bay Area job growth slowed in June and the regional labor force increased by just 5,000 over the past 12 months, far short of what is needed to support future job growth. In June 2018, year over year job growth slowed to the lowest level in several years with +73,400 (1.9%). Low unemployment rates and slowing population and labor force growth raise questions as to where the workers will be found to fill the planned expansions in the region. 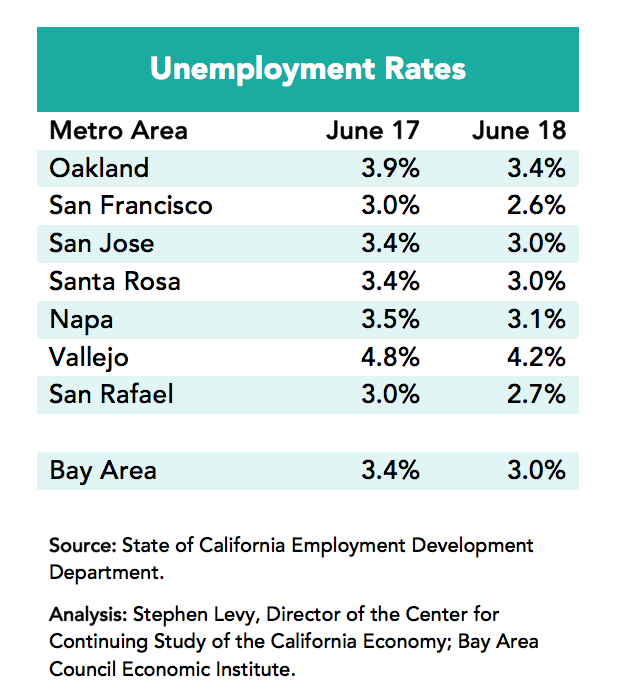 The Bay Area posted a 1.9% job growth rate during the past 12 months just above the state and national 1.6% gain. 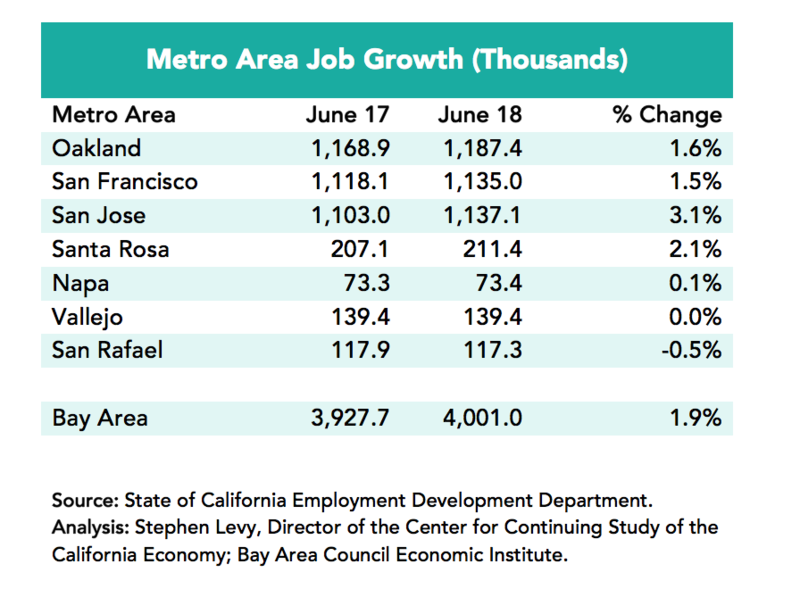 The San Jose metro area was the only part of the region to post seasonally adjusted job gains in June and led the region over the past 12 months with a 3.1% increase. 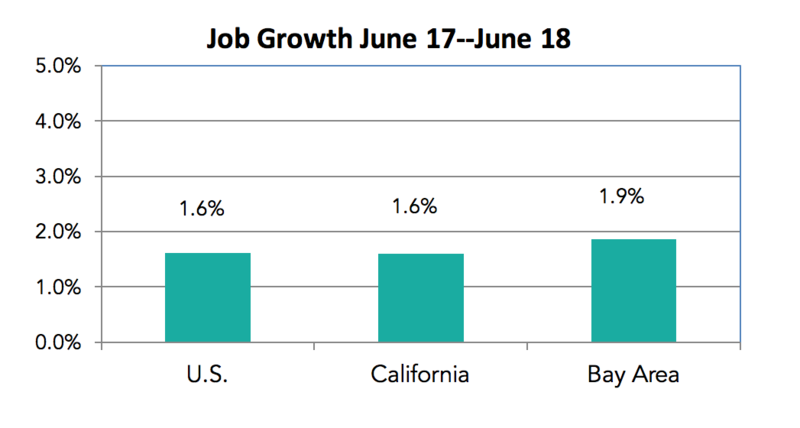 California job levels were almost flat in May and June. Job growth has slowed in recent months and then rebounded, so it is not clear that June represents a permanent slowing though the weak labor force growth is also a warning sign about housing supply and affordability. Unemployment rates rise in the summer months. Unemployment levels were still lower in June 2018 compared to a year earlier, but the pace of decline is shrinking as rates are already very low. The number of unemployed residents fell by 18,700 between June 2017 and 2018—a much smaller decline than in previous months. Labor force growth slowed to a trickle (0.1%) during the past year. 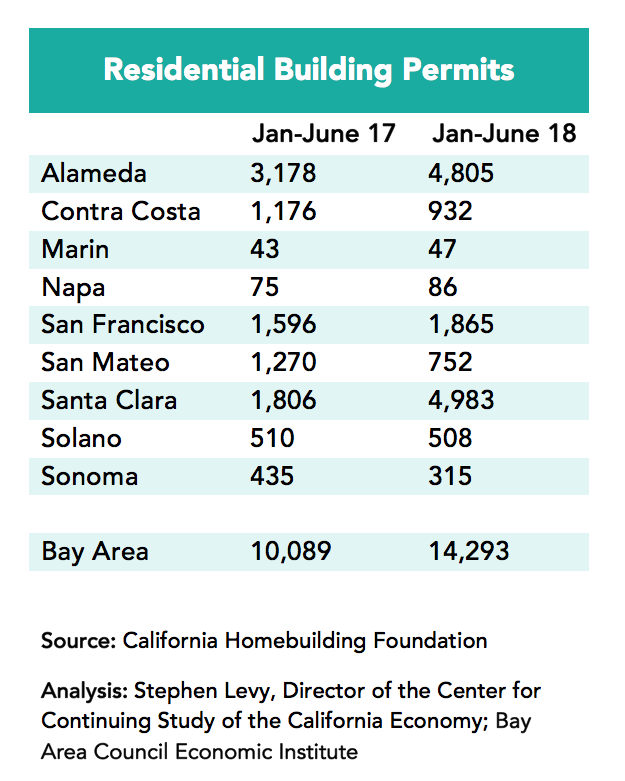 Housing permit levels continued the surge that began in 2017 with permit levels rising 32% in the first five months of 2018 led by strong gains in Alameda, Contra Costa, Napa and Sonoma counties. And project approvals are also rising throughout much of the region. Yet companies are planning major expansions in the region. These expansion plans come at a time when the region is struggling to deal with the challenges of housing shortages and lack of affordability and increasing traffic delay. While permit levels are now keeping pace with current population growth, this housing upturn does not come close to addressing the large shortage built up, much less fully keeping pace with current growth. And not all permits eventually get built. CASA is taking a close look at the missing middle including ideas like adding a new RHNA category for 120%–150% or 180% of area median income and a variety of ways to reduce the cost including modular construction, reducing parking requirements and fees and making it easier to build ADUs. The bottom line, which should be understandable to Bay Area Council members, is that it is really hard if not impossible under current rules to build housing that is affordable to middle income residents yet pencils out for developers. Here is the link to the CASA agendas and packets. The July 18th packet contains several housing production policy ideas.